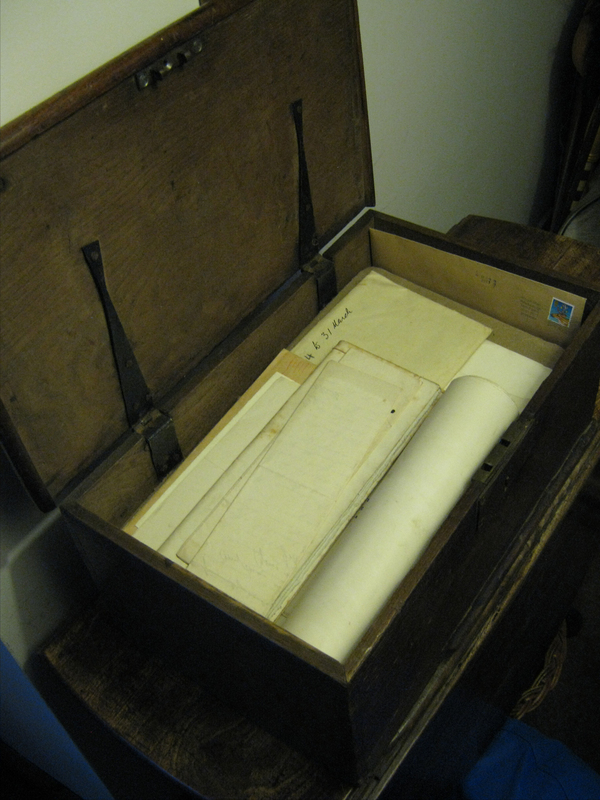 This is my sixth blog post in a series about some old papers of the WALKER family, from Kirkliston, West Lothian, Scotland. See a list of these papers HERE. Below is one of several documents from an envelope labeled “Old Wills etc. of the Walker family”, which is part of a box full of family papers that I received from my aunt at a family gathering in January 2014. 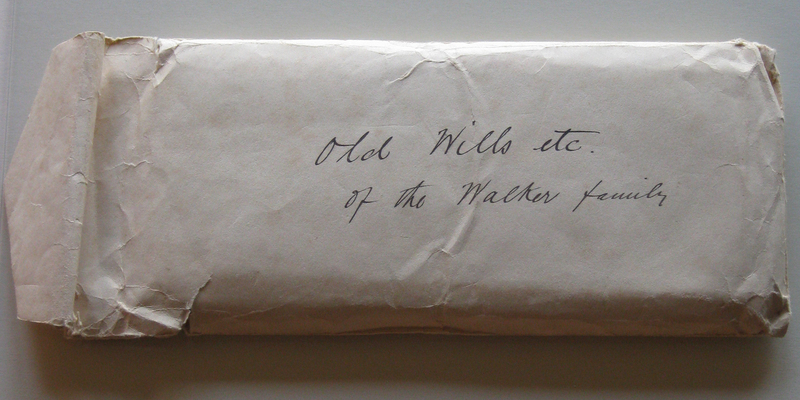 The contents of this envelope all date from the 1700’s. 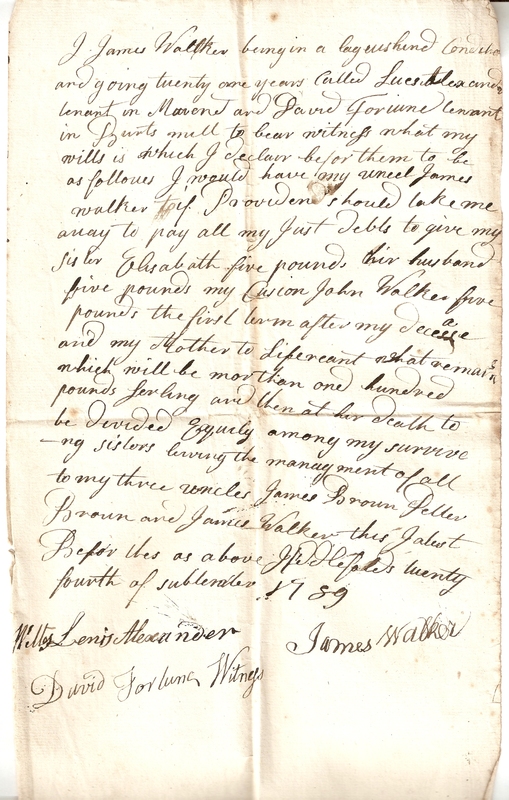 This letter is from James Walker, b.1769. He is the nephew of the James Walker mentioned in several other documents that I’ve posted. He’s the son of Thomas Walker (b.1735), and grandson of William Walker & Elizabeth Barron (m.1728). Please click on the images to see the scans at full resolution. Transcribed text appears in a Maroon colour below each scanned image. At the bottom I’ve made some notes of my own about the document. “Murend”; Muirend lays southwest of Hiddlefaulds, across the Union Canal. “Birds Mill”; lays southeast of Hiddlefaulds, on the River Almond. Jean, chr. 10/5/1776 (source; IGI). Note that the girls here share the same names as their cousins, which could cause confusion when we search the parish registers! There is a marriage in the Kirkliston parish registers between an “Elizabeth Walker” and James Cunningham on 11/6/1785. I once found a tree on-line which had assumed that this Elizabeth was the daughter of James W & Janet Flint! But she would have been only 16 years old at that time (unusual, but not impossible!). However the evidence in the document above, which says that Elizabeth, the daughter of Thomas W & Janet Broun, was married before 1789, leads me to believe that she is the wife of James Cunningham. She would have been 21 at the time of that marriage. I would be interested to find any other evidence that could confirm which “Elizabeth” married James Cunningham, or that could help to solve any similar confusions that might occur. If you have (or know of) such evidence please use the Contact Form. Thanks. This site has been created to share and build up family history knowledge. As such you are welcome to copy and share any material from this website, subject to providing appropriate credit (unless a clear COPYRIGHT notice has been applied to a particular item) in accordance with a Creative Commons Licence.